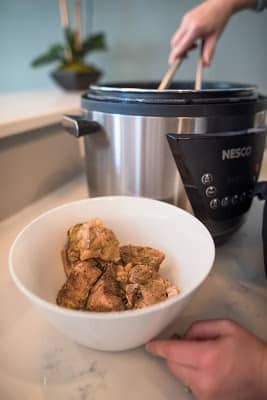 Rub pork shoulder pieces with salt and pepper then place in your NESCO Pressure Cooker with the olive oil and brown for 2-3 minutes. Mix the ingredients and lock lid. Set to high pressure for 55 minutes. 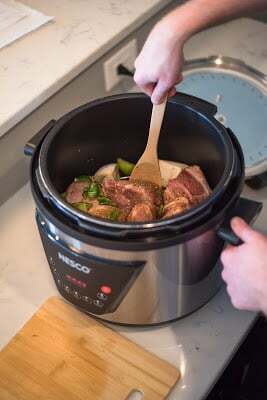 Remove meat from pressure cooker. Take out bay leaves and add broth with peppers to a blender and puree the mixture. This will yield a large amount of green chile sauce. Shred meat with fork. Mix in desired amount of green chile sauce. 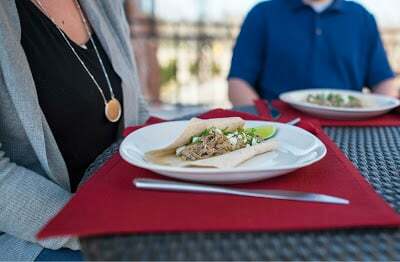 Serve in tortillas topped with crumbled queso fresco, red onion, and cilantro.